On Saturday 22 October, members and friends of the Dominican Order, parishioners, and clergy of the diocese gathered to witness the inauguration of the Shrine of Our Lady of the Rosary at St Dominic’s Church, Haverstock Hill. The principal celebrant was Cardinal Vincent, who was joined by the Apostolic Nuncio, Archbishop Antonio Mennini, Archbishop of Birmingham Bernard Longley, an old friend of the Priory, and Bishop Nicholas Hudson. Also in attendance was the Mayor of Camden, Cllr Nadia Shah. At the beginning of the Mass, banners embroidered over 100 years ago by Dominican sisters and depicting each of the mysteries of the Rosary were brought in procession. During the Mass, the Cardinal’s decree inaugurating the shrine was solemnly proclaimed. As he granted the official status of a shrine to St Dominic’s, Cardinal Vincent invited the faithful to come to the new shrine on pilgrimage and discover the riches of the Church’s tradition of prayer embodied in the Rosary. 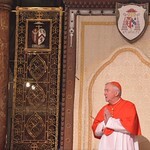 The full text of the Cardinal's homily is available here.